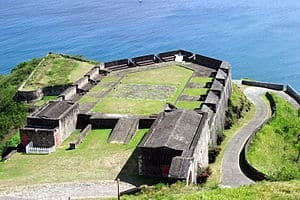 The Action of 16 March 1782 was a minor naval engagement between a British Royal Naval frigate HMS Success and a Spanish frigate Santa Catalina in the Strait of Gibraltar during the American War of Independence. 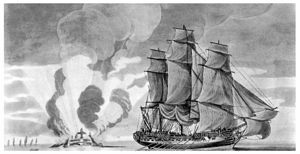 On the 16th of March the 32-gun frigate Success, Captain Charles Pole, and the armed store-ship HMS Vernon (mounting twenty-two long 6-pounders), which was commanded by John Falconer, being off Cape Spartel, on their voyage to Gibraltar, sighted the Spanish 12-pounder 34-gun frigate Santa Catalina commanded by Don Miguel Tacon. This ship was part of a squadron keeping an eye out for any relief convoys heading into Gibraltar which was then under siege. 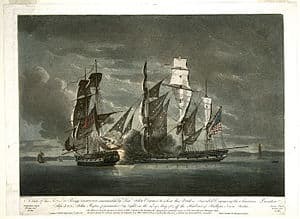 The Spanish frigate having approached within random shot the Success suddenly hauled up and poured a destructive broadside. The Success then wore round, and took up her position which was also mimicked by the Vernon. 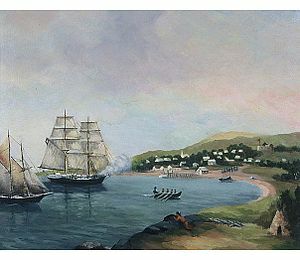 The Spanish frigate having lost her mizzenmast at around 8pm hauled down her colours, and then was taken possession of by the Success. Out of 300 men, the Santa Catalina had 25 killed and eight wounded, and the Success one killed and four wounded. The Santa Catalina was however severely damaged and had been holed below the waterline, and six Spanish sail were sighted the next day. Pole fearing the Spaniards had formed a plan to take possession of the Success and the Santa Catalina decided that once all the valuables and prisoners removed that it was necessary to destroy her, and she was accordingly set on fire and blown up. Pole then headed back to Gibraltar which he made successfully a few days later.